Here you have a dish that is inspired by Buca Di Beppo. I say inspired by because I’ve never even been to Buca Di Beppo, so I could hardly call this a copycat recipe without ever having tried theirs. I saw a copycat recipe for it on Pinterest (this one) and decided to create my own because it looks delicious. I love Italian food, I guess this is probably more Italian American but I love them both! I could live on pasta, especially when it’s covered in a creamy marinara sauce. This recipe is actually very easy. It just takes some time to simmer. I’ve listed an alternate method if you don’t have 45 minutes to an hour to wait for the sauce to simmer (which I may fall back on someday when I’m in need of a quick dinner). 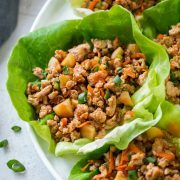 This would also be delicious with grilled chicken or you could probably even replace the chicken with ground beef or Italian sausage. I’ve listed the red pepper flakes as 1 – 3 tsp to taste, so just adjust to your desired heat preference. You can even omit them if you’d prefer (and just make it a creamy marinara and chicken rigatoni). If you’re like me that would be 3 tablespoons but I like a lot of heat, and I resisted adding that much so I could still taste the delicious flavors of the sauce. Sometimes too much heat can hide all the delicious flavors underneath. 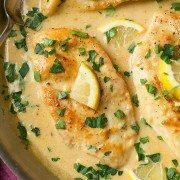 Serve this tonight for dinner and everyone will be more than satisfied with such a simple, creamy and flavorful dish – with just the right amount of spice of course (side note – if you are making it for the kids too, I’d dish theirs up first before adding red pepper flakes. I try to sneak a faint amount in my kids to get them used to a little spice and they always notice :). Enjoy! 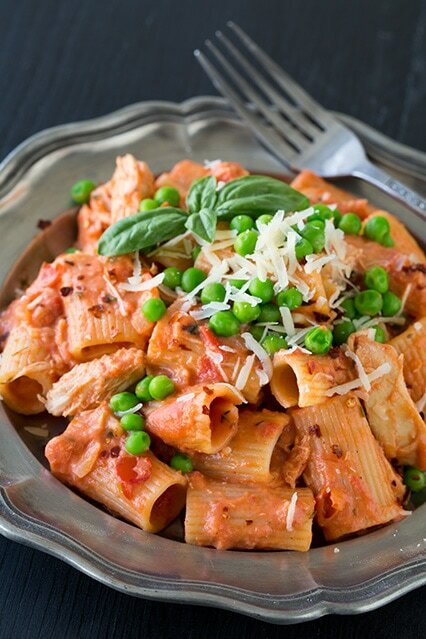 Pasta is tossed with a delicious, slow simmered creamy marinara sauce that has a nice spicy kick to it. Heat olive oil in a medium saucepan over medium-high heat. Once oil is hot, add onion and saute until tender, about 4 minutes, adding in garlic during last 30 seconds of sauteing. Add in crushed tomatoes, fresh basil, fresh rosemary, fresh thyme, red pepper flakes, sugar and season with salt and pepper to taste. Bring mixture just to a bubble then reduce heat and simmer 45 minutes - 1 hour, stirring occasionally, until thickened slightly. Cook pasta to al dente according to directions listed on package. Meanwhile, in a separate medium saucepan, melt butter over medium heat. Add flour and cook, whisking constantly 1 minute. While whisking, slowly pour in half and half. Bring mixture just to a boil, stirring constantly (mixture should be thick). Remove from heat and stir in parmesan cheese and season with salt and pepper to taste. Pour creamy white sauce into red sauce and stir to blend. Drain cooked pasta, return to pot along with cooked chicken and toss with sauce mixture. Place over low heat and let cook several minutes, allowing sauce time to absorb into noodles. 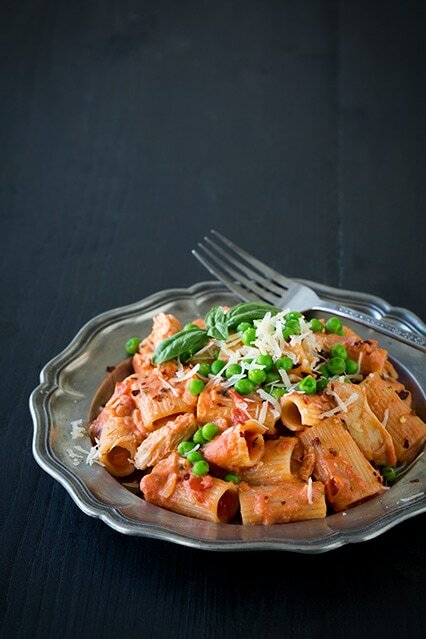 Serve warm garnished with peas, additional parmesan and more red pepper flakes as desired. 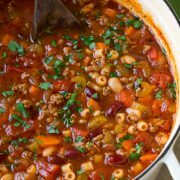 *If you wanted to make this recipe quicker, you could reduce the amount of crushed tomatoes to 2 1/2 cups (instead of the whole can) and add in 1 1/2 - 2 tbsp of tomato paste to thicken the sauce without have to simmer so long. I'd then reduce the simmer time to 15 minutes just to give the herbs time to meld.